Formal Business Apology Form - saves you time and undue stress! Avoid physical violence, tears and other emotional outbursts with this one simple form! Been rude or abusive to a colleague? Got a nasty temper at work? Have employee performance problems? Well, worry no more! 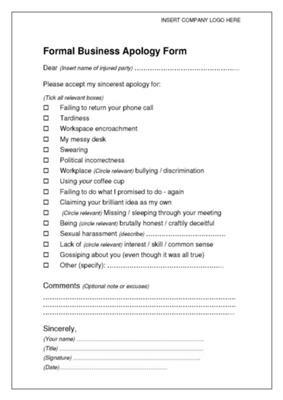 The new 'Formal Business Apology Form' saves you undue stress and embarrassment (no need for uncomfortable face-to-face apologies). Just fill in the form and leave it on your colleague's desk or in their locker. It's fast and effective! Revolutionise your business communication with this new, handy form!